Pennsylvania Dutch and Amish pies are a celebrated treat in Lancaster County. Inspired in part by the early German settlers' fondness for pastries and their English neighbors' expertise in making pies, pies have been an essential part of the region's menu. Pies are such an essential part of Pennsylvania Dutch and Amish tradition, that they are not confined to a particular meal or time of day. In fact, pie is commonly eaten as breakfast food as well as a dessert. Although pie-making follows certain general patterns, recipes have been adapted to meet the taste buds of this health-conscious age. For instance, nowadays vegetable oil is often substituted for lard and the sugar content is often reduced in the pie filling. Many of the most common of the Pennsylvania Dutch and Amish pies contain the fruits and nuts which grow in such abundance in rural Pennsylvania. The pies are often characterized by the Pennsylvania Dutch taste for combining sweetness and tartness. Some of the most popular types of pies which are common throughout the world but have a unique Pennsylvania Dutch flavor when made in Lancaster County include apple, rhubarb, sour cherry, gooseneck pumpkin, peach, pear, grape, raisin, huckleberry, walnut, and pecan. The pies can be prepared with or without a top crust. There are also a lot of Pennsylvania Dutch and Amish pies that are not commonly found outside Lancaster County or areas populated by the Pennsylvania Dutch. During your visit to Lancaster County, treat yourself to some of these local favorites. Since delicious apples are so plentiful in Lancaster County, apples pies have become one of the most popular of the Pennsylvania Dutch and Amish pies. Schnitz Pies are a particular favorite in the region. They are made by peeling and slicing the ripe apple. In fact, the word "schnitz" means to cut into pieces. The apples pieces are then laid outdoors under the sun or inside on racks above a heating source for about 24 to 48 hours until they are dried. The dried apple pieces are stored in dry containers throughout the year until they are ready to be used. When it is time for preparation, the dried apple pieces are soaked and slowly boiled in water until they are soft. The apples pieces are then mashed and mixed with lemon extract, brown sugar, and cinnamon. The mashed mixture is then baked in a pie shell until ready. Schnitz pies are traditionally served at lunch following the Sunday morning church service. The pies are also generally served at meals where potato soup or bean soup is on the menu. Unlike the fruit pies, mincemeat pies are a hearty meal in themselves. These pies which the Pennsylvania Germans learned from their English neighbors date back to medieval times when spiced meat dishes were commonplace. Despite these medieval English origins, mincemeat pies fit in well with the Pennsylvania Dutch cooking habits where home-butchering was common. With home-butchering, most of the meat was used in some way. Oftentimes, leftovers and scraps were dried, canned and stored in the attic or cellar. These leftover scraps were ideal for the mincemeat pies. Although there are many variations, mincemeat pies are generally made by first cooking the meat until tender at which time it is cut into very fine pieces. The meat is then mixed with a combination of raisins, apples, oranges, lemons, sugar, salt, cinnamon, cloves, and cider. Sometimes beef broth is added for moisture. This mixture is simmered for about 15 minutes. The mixture is then poured into a pie shell and baked until ready. It is believed that the tradition of making green tomato pie in the autumn derived as a way to supplement the menu when the annual supply of apples began to run low for the year. It is also believed that green tomato pies were prepared and served as a tasty way of using up the harvest's excess tomatoes. In any case, the pies are generally made by combining thinly sliced green tomatoes, brown sugar, cinnamon, lemon juice, cloves, and butter into a pie shell. The result is then baked until ready. The overall seasonings and spices are similar to those used in mincemeat pies. 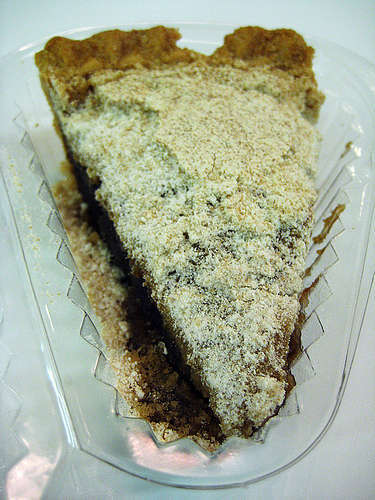 Try a slice of Shoofly Pie. Here the filling is made up of molasses and custard spiced with cinnamon, ginger, nutmeg and cloves. Shoofy pie is a hybrid between a dense cake and a syrupy pie. The pie is generally made of a mixture of molasses, flour, baking soda, eggs, and water. The mixture is poured into a pie shell and topped with crumbs consisting of flour, brown sugar, and shortening. The pie is then baked until ready. If your taste buds have been watered by reading about the Pennsylvania Dutch and Amish pies of Lancaster County and you would like to learn more about the local Pennsylvania Dutch cuisine, please click on the following links.